This is members only content. Learn about our membership options here. 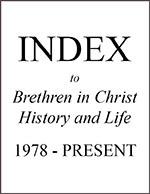 This index includes all articles and reviews published in Brethren in Christ History and Life since its inception in 1978 until 2012. A Contents page explains how the index is organized.